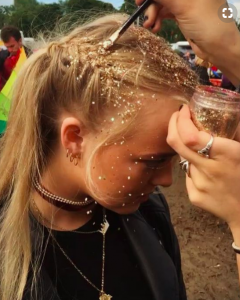 Our 5 Fav Festival Hairstyles! 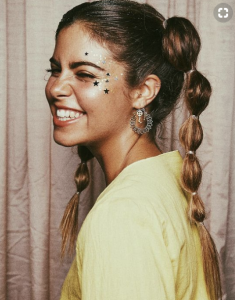 Our 5 Fave Festival Hairstyles! It’s festival season, baby! Bring out the fringe, the leather, the glitter, the sequins, and everything in between! Summer brings major music festivals across the country. If you have been to a music festival or have seen pictures of one then you are well aware that each festival is secretly a fashion show. People plan out their look months before the actual event. We are here to give you some hair inspiration for your festival! 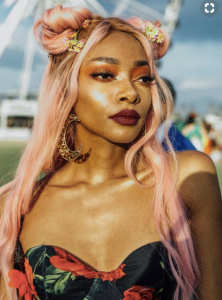 Here are our five favorite festival hairstyles. Take notes! If you’re not wearing a hat then let’s dress up that hair! This summer we are seeing a lot of braids, and we’re loving every single one of them! We all know that braids come in all shapes, sizes, and designs. For your upcoming festival, try skinny braids above your ear. This takes some of the heat off of your back for those long hot days of dancing. To dress it up add some hoops throughout the braid! Visit your local art and craft store to pick up some beads, hoops, and feathers to decorate your braids. We can’t wait to see your design! Embrace your inner child by rocking some pigtails! You will quickly learn with festival looks that everything must be dressed up or have a fun twist to it. With these iconic Pippy pigtails, add some texture and design to it. After setting your ponytails, section off each inch with a small elastics to create a wave effect. This looks great with some fun earrings that you can show off. We want to see your buns this summer! Space buns, that is. A major shoutout to the 90s for bringing these things back. We love this look because how easy it is! We all know how to make a bun. That’s the first thing you learn after mastering the ponytail. You can wear space buns at the base of your head or high on top for the world to see. Spice it up by adding some flowers to your buns! Bring out the glitter, it’s time to dazzle everyone! When you dance we want to see you sparkle. It’s no secret that glitter is one of the hottest trends this summer. Those of us that have kept our glitter from our crafting phase are jumping with joy. So break out all the glitter you have stashed. 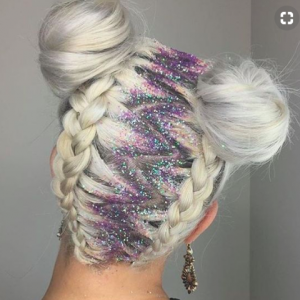 After styling your hair, dust the glitter where you want it to land. Pro tip: Set it with heavy-set hairspray. This will help the glitter to stay put while you dance the night away. For those of you that really want to make a statement at your next event, why don’t you step out of your comfort zone? Add all of these hairstyles into one unforgettable look! Section your hair off either in a straight line or a zig-zag. Starting from the bottom, French braid your hair until you reach a place where you want your space buns to lay. Add the final touch with some sparkle. All eyes will be on you! Now, we know that these hairstyles can seem a little overwhelming. Thankfully our cosmetology program educates wonderful and passionate students that would love to create a festival look for you. Come pay a visit at The Salon Professional Academy Huntsville. Let us style your hair and make your festival goals become reality! Book an appointment with us today. Simple Hairstyles For Busy Students!